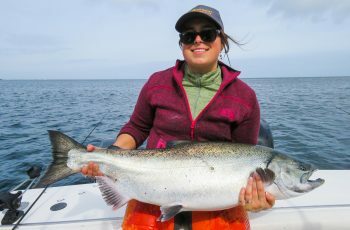 The chinook are here, the August run is in, and the boys are heavy hauling out at the usual points and a few secret ones. Chinook in all sizes are blasting by Langara, some deep out at Cohoe Point, others shallow in the pass and out the west side. 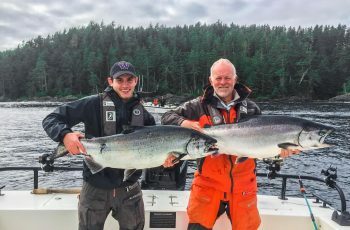 Consistent fishing and happy guides and guests all around, yes August is on fire for sure. Top fish today at the Lodge was Bryon Eveleys 41 lb specimen taken out at Cohoe Point in a squall filled morning with a moderate chop. Dan Roberts scooped a 36 at the REEF, that is a nice score. I am fishing with John Simpson and Jollean this trip, and we are having a good go at it. We started our trip on Sunday and first rod in the water out at Cohoe Point we grabbed a 28lb fish at 90 feet on the cable. 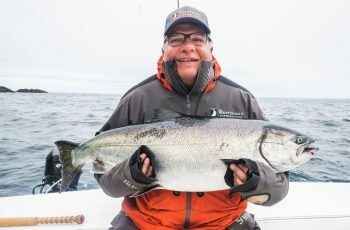 We then landed a series of teeners and some nice coho before heading west Cape Knox way and getting into some nice chinook along the kelp, Jollean grabbing a 25 lb fish and several high teeners. This am we were greeted by 25 knots of South East and a rough Cohoe Point in pouring rain and mist, I could not see dammit! The rain could not fall any harder, and a lot of guests headed back to the barn. We never left the dock to 8am, so we stuck er out, cranked up the music, and pretended it was not raining. As the boats left the bite came on, first Jollean angling a 28 lb fish in heavy chop and a pitching boat, well done. 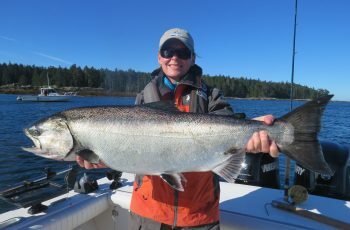 Not a half hour later she grabbed a 25 for company, the daily limit for chinook. Soon after this fish she cranked up a 19 lb halibut, a clue to the depth we were targeting. Yes, 110 feet was producing on the wire, so sad if you don’t have the cable, this fishery is not for you. John decided to catch a fish, and at 1130 am, we had an airborne screamer off the wire, a torpedo from 120 feet, looked like a marlin leaping out the stern of boat 4. This fish put up a great fight, and was a hooked with a lone hook in her snout, so into the revival box, the hippaquarium for measurement, pictures and a proper release. This fish measured 39 by 27, a freak…wish I could post the pics, looks like something Eli Manning chucks for a living! 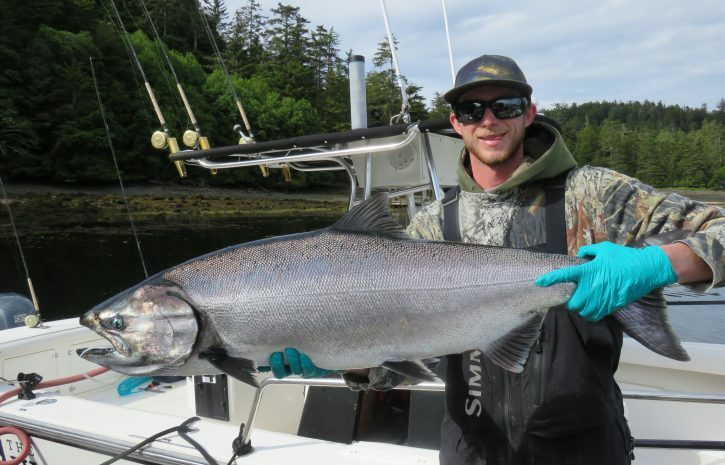 So nice to put that one back, with so many 18 to 28 lbers around, why would you bonk a tyee? 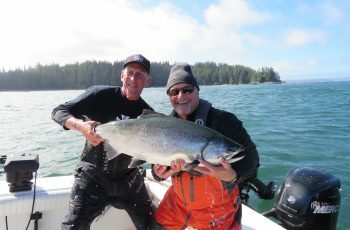 These fish are a treasure and should always be released if healthy. I wish the boys down south would get with the program, these fish need to make it back to the river, and it starts with each of us. No use complaining about small fish if you do not do your part, myself included. I must say, sure feels good to see them swim away back along the shore and into the kelp where they belong, not covered in frost propping up buckets of ice-cream ha ha! 31 lb release at noon today for John, on the west side spot! Heaps of bait, story to follow tomorrow!